This lake is the where Woolworths are planning to put the on-site wastewater disposal for their supermarket. It is the site for the "irrigation" i.e. where all wastewater and sewage from their 2500m2 commercial enterprise is expected to be absorbed into the earth. We told them it was a bog! 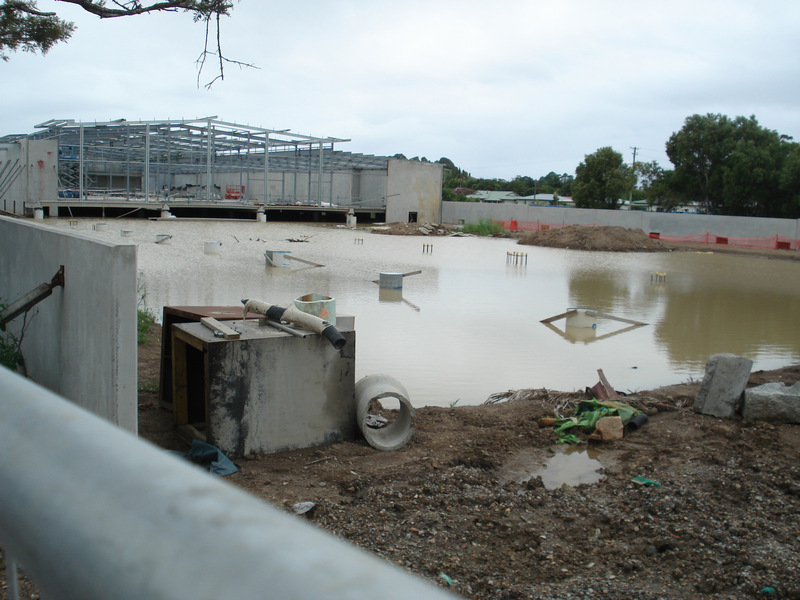 Byron Shire Council rejected Woolworths on-site wastewater disposal plan as flawed, and approval for the "sewer-on-a-bog" was obtained by Woolworths from the Land and Environment Court in Sydney. The Court also gave Woolworths permission to pump sewage out several times per year for disposal somewhere else - an action which had, until then, been considered unlawful. This Left Hand was taken 28th December 2010. There had been weeks of rain, although no other parts of Mullumbimby were flooded. In fact Mullumbimby escaped the floods which ravaged Queensland and other parts of NSW. The Woolworths lake has largely dried up now, nearly 3 weeks later. The photo on the right was taken 28th of January 2011. The water seen in the LH photo took nearly two weeks to dry out. By comparing the two photos it looks as if the water was nearly 1.5 meters deep near the building. In fact it looks like the bulk of the site is below surrounding ground level and will flood repeatedly with modest rainfall. Since the floor of the building is now in place it would appear that Woolorths have no intention of filling in the sub-floor space thus creating a breeding ground for mosquitoes and stagnant water.